Inordinate ambition to maintain permanent membership on the list of world billionaires is what is being blamed for alleged connivance of Lagos businessman, Alhaji Aliko Dangote and other notable oil moguls like Mr. Wale Tinubu and Mr. Jite Koloko to cripple Nigeria's oil refining capacity through elaborate bribery scheme which earned them a staggering N29 Billion profit. According to Huhuonline investigations, an honest approval said to have been given by former President Olusegun Obasanjo to three leading indigenous oil companies owned by Dangote, Tinubu and Koloko was said to have become the lunch pad for wide spread bribery of officials of Nigeria National Petroleum Corporation (NNPC) leading to tampering with the nations oil refining capacity. Huhuonline was told that Obasanjo saw enough justification in a proposal allegedly drawn by MRS Oil group and submitted by its owner, Dangote. Obasanjo during his presidency allegedly allowed exclusive refining contract for Dangote to handle and supply Low Pour Fuel Oil (LPFO) believed to be crucial in petrochemical industrial dye for Nigeria's once bumming textile manufacturing holdings. It was said that no sooner had Dangote got approval for the critical and juicy downstream supplies of the product, he was said to have acted in concept with the two other beneficiaries of the contract to purportedly bribe relevant NNPC operatives. Needed sizeable diesel meant for national consumption was diverted and used to mix HPO in other to get LFPO and also to practically shut down the installed domestic refining components. Sources who elected anonymity said “Aliko Dangote in cahoots with owners of Oando group, ensured that the oil refineries in Nigeria operate epileptically. This they achieved by making sure that an important element of the refinery, the Fluid Catalytic Cracking Unit, which s breaks down the heavy hydrocarbon molecules that make up crude oil act malfunction all the year round. Huhuonline.com checks revealed that Obasanjo had intended that Dangote would make the LPFO available internally at ?8:30K per liter this did not happen. All the products were taken outside Nigeria and sold at $250 per tonne. While Dangote and co smiled to the banks Nigerians groaned under pains of unavailable refined petroleum products. Because the important product was not available for textile operations, factories were closed and workers were sacked. Jackson Gaius-Obaseki, the former group managing director of NNPC, admitted as much two Fridays ago when he told the ad-hoc committee investigating the operations of the corporation that companies like MRS Oil and Gas, Noel Energy, Haske Enterprises and Ocean & Oil Limited (the company that acquired the now defunct Unipetrol and Agip before rebranding into the Oando Group), have all been beneficiaries of the regime. Since NNPC officials were allegedly bribed by Dangote and his associates that have now been identified as a "dangerous cartel," the fluid crackers in the refineries were removed to create the impression that the refineries have been completely grounded. They therefore export Nigerian crude and make huge foreign currencies. An oil industry insider explained that Dangote and the others realized huge dividends of close to N29 Billion and that Nigerian law makers and the President must act with dispatch and honesty to make them refund nothing less than N25 Billion. 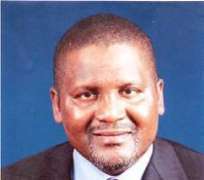 The Insider who preferred anonymity because of recent notoriety of Aliko Dangote "as chemical Ali" said that Dangote and his friends remain the worst threats to the economic stability of Nigeria and they must be stopped.